Death in a Church of Life: Moral Passion during Botswana’s Time of AIDS. By Frederick Klaits. Berkeley, CA: University of California Press, 2010. Pp. 368. Paperback US$ 29.95 ISBN 9780520259669. Home to one of the world’s highest HIV prevalence rates, the southern African Republic of Botswana has drawn increasing attention over the past decade both for the magnitude of its epidemic—twenty-five years after the first case of AIDS was diagnosed in the country in 1985, prevalence rates amongst pregnant women had risen above 37%—and for the dramatic steps taken by the government in recent years to provide free antiretroviral (ARV) therapies for citizens through the national public health system in partnership with private philanthropic foundations. 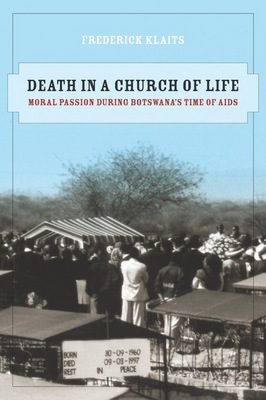 In Death in a Church of Life: Moral Passion during Botswana’s Time of AIDS Frederick Klaits presents a sensitive, fine-grained, and compelling account of a small, tightly-knit apostolic church located in Old Naledi, the oldest squatter settlement in the capital, Gaborone. Drawing on his intimate acquaintance with the Baitshepi Apostolic Church and its leaders fostered over the course of some thirteen years, Klaits’ analysis centers on church members’ efforts “to sustain love in the context of the widespread illness and death” (2). Klaits focuses broadly on how the HIV/AIDS epidemic and the negative sentiments (e.g., grief, anger, jealousy, scorn) that have accompanied it have challenged the capacities of Batswana (as citizens of Botswana are called) to love and care for one another. One goal of the study is “to understand how Christian religious commitments to love in contemporary Botswana shape the ways in which people care for one another at a time of widespread sickness and death” (3). More specifically, Klaits endeavors to bring the complexity of this broader set of challenges to light by focusing on how Baitshepi members confront them, that is, “to specify the particularity of Baitshepi Church members’ own methods of loving, so as to grasp the broader processes and practices whereby love has become a subject of moral passion in contemporary Botswana” (10). Although HIV/AIDS cannot but influence both Klaits’ research and the lives of his informants, the study is shaped far more by Klaits attentiveness to love (lerato) as both method (in terms of his own efforts to be open to conversion to apostolic Christianity) and as object of analysis than by AIDS (10). Following other scholars of the Tswana who have emphasized the ways the somatic and the sentimental are mutually implicated in Tswana conceptualizations of intersubjective relationships and the ways these mutually constituted sentiments and somatic states are created and sustained or unmade through interpersonal interactions (Comaroff 1985; Comaroff & Comaroff 2001; Durham 2005; Lambek & Solway 2001; Livingston 2005, 2008), Klaits defines lerato as “action and sentiment directed toward enhancing the well-being of other people […] something people do as well as feel, since it involves communicating what is in one’s own heart and body to those of others” (3-4). While concerns about the management of these simultaneously sentimental and somatic relationships long predate the epidemic, the scale of sickness and death has forced many (if not most) Batswana to “confront questions of who has loved, care for, scorned, or been jealous of whom in determining how to provide for family members with acute or debilitating illnesses, how to look after survivors, and how to mourn the dead” (6). Drawing on the work of T. O. Beidelman (1993), Klaits frames this problem in terms of “moral passion,” that is, the ongoing efforts of Batswana “to shape their own and other people’s manner of imagining” intimate relationships through, among other things, faith (tumelo) (18, 33, 35). These moral passions shape and are shaped by highly personalized relations of suffering and care inasmuch as Batswana’s “styles of feeling and acting toward other people” (whether shaped by faith, by jealousy, or by fears of witchcraft) can “possess consequences for the qualities of ongoing relationships” (78). Skillfully knitting together concerns about the moral, material, and affective impact of the epidemic, the book focuses to a large extent around MmaMaipelo, the Bishop of the Baitshepi Apostolic Church who founded the church in 1982, and her neighbors, friends, and relatives. While churches of the spirit (dikereke tsa semoya) often emphasize “bringing participants’ sentiments to bear on one another’s bodies in ways that enhance well-being” (8), MmaMaipelo, sought to establish relations of maternal love generated and fostered through sentiments and actions of love and care with her congregants, her “children of the spirit” (bana ba semoya). Klaits carefully tracks the visiting and residence patterns through which the mostly female congregants move in and out of MmaMaipelo’s compound, as well as the myriad activities (including bathing, nursing, visiting, praying) congregants undertake on one another’s behalf. Through these loving actions congregants seek to build up one another’s bodies, strengthening their sentimental and somatic interdependence (31-32). In this manner, they engage in what Klaits calls the “domestication of inequality,” that is, an attempt to manage relationships in such as way as to emphasize the interdependence of individuals in terms of their wellbeing, mitigating neoliberal trends toward individualism and isolation as well as feelings of jealousy and scorn. The book’s first chapter introduces these dynamics through a case study of the illness and death of a young church member. The second chapter illustrates how practices of building and housing “reflect contested understandings of how [Batswana] ought to value one another’s capacities and sentiments” (33). Chapter 3 examines how shared material substances, such as water, beer, and blood, can transform sentimental relationships between people, emphasizing how Baitshepi members labor to orient these sharing practices toward the constitution and maintenance of love. Chapter 4 focuses on the voice, illustrating how Baitshepi members work to orient vocal practices (singing hymns, praying, hearing, preaching) in such a way that these practices positively affect others’ sentiments and bodily conditions. Chapter 5 examines MmaMaipelo’s efforts to create and foster relations of love and care as she and other congregants nurse the ill and dying and console the bereaved, illustrating the “novel configurations of caring work among young women” and “new imperatives for managing the impact of their sentiments on the well-being of others” to which the epidemic has given rise (219). The last chapter returns to funerals, bringing the book full circle as Klaits explores the imperative that the bereaved “give up,” that is, not succumb to grief and to the anger and accusations of wrongdoing to which grief may give rise, and that others mourners in these highly public spaces demonstrate civility (maitseo) so as to “manage the impact of their sentiments on the feelings of others who may not share them” (266; see: Durham 2002; Durham & Klaits 2002). The relations of somatic and sentimental interdependence that bring mourners together may be transformed through the funeral itself. For MmaMaipelo, Klaits argues, the relations of love and care demanded by housing, nursing, and burying are all the more difficult to maintain in the face of the epidemic, and therefore all the more necessary (14, 288). This “alternative ethos” forms the crux of Klaits’ argument, namely, that the actions MmaMaipelo and the members of her church undertake in their moral passion to foster love and care constitute a “political endeavor” insofar as their faith in God enables them to “recast their ongoing relationships with other people” (18-19). The absence of pain, anger, outrage, or protest in their responses, or their reluctance to shame and injure another person by naming or even speculating about his HIV status should not be regarded as ignorance or cowardice, but as a deliberate effort to positively impact their own and others’ bodies and sentiments. “Local styles of speaking truth about sexually transmitted and fatal illnesses,” he argues, “tend to constitute methods of working out caregiving relationships, rather than of making claims about unequal power or of assessing the worth of individuals in relation to standards of normality” (284). Furthermore, institutions attempting to address the epidemic ignore the significance of relations of love and care, however complex, unequal, and even ambivalent, at their peril: “to whatever extent AIDS control measures are going to succeed in Botswana, their success will be due in no small measure to the hard work people devote to loving and caring for one another over the course of their lives” (288; see: 15). Klaits makes a substantial contribution to anthropological analyses of Christianity in southern Africa (Engelke 2007; Werbner 2011), speaking to ongoing conversations about the specificity of apostolic Christianity in the contemporary moment (Harding 2000). Klaits’ account productively complicates research that emphasizes demands that Christian converts make a “radical break” from past practices and relationships (Meyer 1998; see Robbins 2003) or that focuses on the problem of locating and maintaining distinctions between Christians and non-Christians (Keane 2007). The book also contributes to a growing literature on religious responses to AIDS (Dilger 2007; Prince et al. 2009), and on historically and culturally specific ways of ethically framing the epidemic, its public health and biomedical interventions, and public responses to both of these (Comaroff 2007; Hunter 2010; Nguyen 2010). The ethnography is rich and detailed, both meticulous and expansive. If anything, Klaits’ desire to do justice to his informants and to the enormous wealth of data from which he has to draw can make the book unwieldy for the reader at times. The book spans thirteen years of research (1993 to 2006), and while Klaits’ ethnographic expertise is indisputable, the sheer mass of data presented sometimes obscures rather than illuminates the book’s theoretical arguments. In various chapters Klaits relies on case studies of members of the Baitshepi Church, including MmaMaipelo’s “fleshly” and “spiritual” children, and kinship charts of the Church’s main members, however schematic or incomplete, might have helped the reader track the relations between the subjects of different case studies and anecdotes. In addition, while it is exciting to see a scholar of southern Africa explicitly address the ways ideologies of voice and language inform the management of sentimental and somatic attachments, Klaits could extend these insights to speech genres beyond the context of church services, funerals, and hospital visits, casting light on a larger set of ongoing conversations amongst Batswana regarding who should speak about AIDS, what it means to do so, and what institutional pressures are brought to bear on the forms of expression that have (or have not) accompanied the treatment program. Beidelman (1993 ) Moral Imagination in Kaguru Modes of Thought. Washington, D.C.: Smithsonian Institution Press. Comaroff, J. (1985) Body of Power, Spirit of Resistance: The Culture and History of a South African People. Chicago: University of Chicago Press. ——— (2007) Beyond Bare Life: AIDS, (Bio)Politics, and the Neoliberal Order. Public Culture 19(1):197-219. Comaroff, J. L. and J. Comaroff (2001) On Personhood: An Anthropological Perspective from Africa. Social Identities 7(2): 267-283. Durham, D. (2002) Love and Jealousy in the Space of Death. Ethos 67;155-180. ——— (2005) “Did You Bathe This Morning? Baths and Morality in Botswana.” In A. Masquelier, ed., Dirt, Undress, and Difference: Critical Perspectives on the Body’s Surface, pp. 190-212. Bloomington, IN: Indiana University Press. Durham, D. & F. Klaits (2002) Funerals and the Public Space of Sentiment in Botswana. Journal of Southern African Studies 28:777-795. Engelke, M. (2007) A Problem of Presence: Beyond Scripture in an African Church. Berkeley: University of California Press. Harding, S. (2000) The Book of Jerry Falwell: Fundamentalist Language and Politics. Princeton, NJ: Princeton University Press. Hunter, M. (2010) Love in the Time of AIDS: Inequality, Gender, and Rights in South Africa. Bloomington, IN: Indiana University Press. Keane, W. (2007) Christian Moderns: Freedom and Fetish in the Mission Encounter. Berkeley: University of California Press. Lambek, M. & J. Solway (2001) Just Anger: Scenarios of Indignation in Botswana and Madagascar. Ethos 66:49-72. Meyer, B. (1998) “Make a Complete Break with the Past”: Memory and Post-colonial Modernity in Ghanaian discourse. Journal of Religion in Africa 28:316-49. Nguyen, V-K. (2010) The Republic of Therapy: Triage and Sovereignty in West Africa’s Time of AIDS. Durham, NC: Duke University Press. Prince, R., P. Denis, and R. van Dijk (2009) Introduction to Special Issue: Engaging Christianities: Negotiating HIV/AIDS, Health, and Social Relations in East and Southern Africa. Africa Today 56(1): v-xviii. Robbins, J. (2003) On the Paradoxes of Global Pentecostalism and the Perils of Continuity Thinking. Religion 33:221-31. Werbner, R. (2011) Holy Hustlers, Schism, and Prophecy: Apostolic Reformation in Botswana. Berkeley: University of California Press. Brada B. Book Review: Klaits’ Death in a Church of Life. Somatosphere. 2011. Available at: http://somatosphere.net/2011/book-review-klaits-death-in-church-of.html/. Accessed April 24, 2019. Brada, Betsey. 2011. Book Review: Klaits’ Death in a Church of Life. Somatosphere. http://somatosphere.net/2011/book-review-klaits-death-in-church-of.html/ (accessed April 24, 2019).